Another weekend, another award ceremony somewhere in the world, another red carpet to dissect…this time it’s the MTV EMA’s which took place in Milan on Sunday night. There are some greats and some not so greats (as always! ), so buckle up for the ride…. The hostess, the absolute hotshot that is Ruby Rose. KILLED. IT. In every way, every look, just ROCKING. The awe is now complete. I mean some of her looks are a bit full on, but remember she’s presenting a show and has to look like the ring master. These outfits are exactly what I would wear if I was in her shoes!! This was her entrance look, pure fuckoff hot as hell style. I mean obviously it helps that she’s a total ride…but I love the black, kickass, nasty fashion sense she’s got going on…more please…just LOOK! In the words of the Lego Movie “everything is AWESOME” I am PURE envious. I would go crazy with this woman’s wardrobe…man I would even go out at the weekend, it’s THAT good! Yes. Crazy town. But we will move swiftly on because her wins far outweigh this raw pasta moment. Ruby Rose, I salute you. And how did everyone else do?? If you’ve got them, let them all hang out…not sure she could be feeling that comfy in this though, not sitting down at an awards ceremony anyhow…lots of checking everything is a ok I’d imagine…! Still, gorgeous and cool bag. It’s all quite blah isn’t it…I mean it’s nice and all but we’ve seen it before. I AM FAMOUS AND ON A RED CARPET AND HERE ARE MY ABS AND LONG LEGS!!!!! Finally! I adore this, very very loungewear cool. Seventy tastic. I would love to get my hands on a gold lamé trouser suit. I don’t like the top she has on though, maybe wear nothing and button the jacket and wear a black silk tie/scarf. mmmmmmmm Christmas party time! Fantabulous shoes. Great set of pins. Not sure about the sheer bit at the top but all in all lovely stuff. One for the lads, dapper Dan indeed. Mark Ronson looks classic, if only I could get my fella to dress like this…NOT A CHANCE. Hailey Baldwin. Another chica for the look at my toned body file. She might as well have worn a swimsuit…but I mean kudos, she pulls it off. 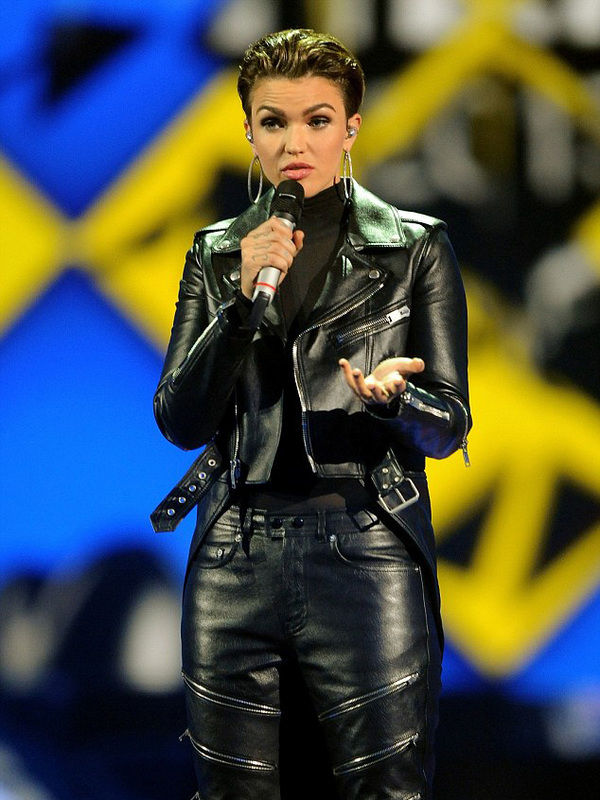 Listen, it’s a no brainer, Ruby Rose owned the night.